And, by overrated I mean he is one of the best short stops to ever play the game of baseball. Even though, I'm a day late on the news, Derek Jeter broke Luis Aparicio's mark of all-time hits by a short stop. Jeter is well on his way to being the Yankee with the most hits ever. Currently, Jeter sits 60th on the all-time hit list and third among active players - only behind Omar Vizquel and Ken Griffey Jr.
Jeter has received plenty of criticism over the years and, I tend to believe people don't truly understand just how great he is. When all is said and done, his numbers will put him at the top of the game. He's not flashy. He's not a power hitter. He came up in a time where chicks dig the long ball, and Jeter isn't that type of player. However, Yankees fans understand just how valuable he has been to the team and know they are never going to get cheated when Jeter plays. I know he's getting older and he has less time in front of him than behind him. So, to all the haters: put down that Haterade and enjoy a good player. He's one of the few people are going to remember. Even as a Red Sox fan, I've always like Derek Jeter. It's been an impressive career already! .262 career average, to his .311 career OBP, to his .653 OPS. I guess he sure did play a lot of games and hit a lot of singles. Congrats to Jeter. I'm not a Yankee fan, but I recognize that he's the only guy who could give Pete Rose a run for his money. Rose had 2,547 hits at age 35, and Jeter has 2,688 and counting. Although staying healthy and hitting for another decade is a big task. The only way Jeter can keep going is if he moves to the outfield. I know he's still a pretty decent shortstop, but I don't know how much long he'll be able to last there. He still has the quickness to be a solid center fielder. He's always been a good hitter, but he's a tremendously overrated shortstop. He has a flair for the dramatic, for sure. But what's dramatic for Jeter is routine for so many others. That a far better shortstop in Alex Rodriguez actually moved to 3B to accommodate Jeter is amazing to me. Jeter should've moved to 3B, not ARod. Jeter is one of the all-time greats - there is no question about that. I wonder how he will view his career. After five years in the league he had four rings. Then played in World Series losses in 2001 and 2003. So no World Series ring in quite a while. Could he get a 5th one this year? 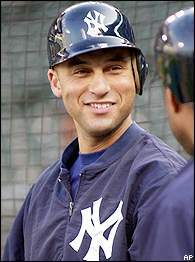 Jeter is an average to above average player who played in NY at the time they were winning and popular. Swap Jeter and Vizquel, and Jeter's forgotten and Omar's in the Hall. He got lots of hits batting high in a good line-up. He had plenty of chances to get those hits. How can Jeter have the most hits as a SS if Vizquel has more than him? Or do Vizquel's numbers count his (limited) time at other positions too? It's as a SS. If they got a hit as a DH or any other position, it does not count. Few Yankees are ever under rated, but Jeter is a great SS. That said, Shortstops of the 1960's never really get their due. Aparico was a very capable lead-off hitter who stole 500 bases in a day when many SS's batted 8th and hit .220 . He also played in a time when the pitchers dominated the game. It really amazes me that guys like Concepcion, Campaneris, Fregosi and Wills have such a hard time getting into the Hall-of-Fame. They were the best at the position during their day. too bad Jeter wasn't around to be in that 62 set. Overall he is one of the best ever but over rated still. 2005 MLB doubles leader with 50 doubles. ALL-TIME 5th most games played in a row.